The DAYDREAM ruffle dress is the ultimate fluttery dress with double flutter sleeves and a hi-low ruffle hem! Your little girl will LOVE this! Lined bodice and unlined skirt. 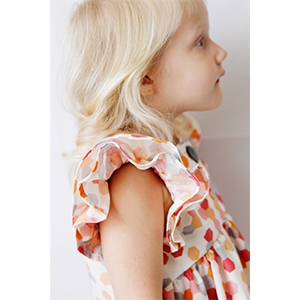 This is a simple sew that involves 1 buttonhole and a few ruffles. Great for a beginner ready to try some more advanced techniques! 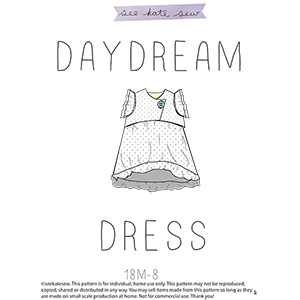 Pattern has eight sizes included: 12-18M, 2T, 3T, 4T, 5, 6, 7 and 8 and is suitable for confident beginners. 30 page pdf file with pattern pieces, step by step instructions, and professional illustrations.